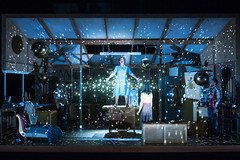 Designer Giles Cadle made his Royal Opera debut in 2015, creating the designs for the world premiere of Matt Rogers’s The Virtues of Things in the Linbury Studio Theatre. Cadle studied architecture and theatre design. His opera design credits include The Snow Maiden, Hänsel und Gretel, La Cenerentola and La fanciulla del West for Opera North, Les Contes d’Hoffmann for English National Opera and in Munich, Les Huguenots for Deutsche Oper Berlin, Lulu and The Midsummer Marriage in Munich, Peter Grimes in Geneva, Der fliegende Holländer for New York City Opera, Duke Bluebeard’s Castle for ENO and the Mariinsky Theatre, Rusalka for Royal Danish Opera, Boris Godunov for New Zealand Opera and Flight and Nothing for Glyndebourne. Cadle’s theatre credits include The Treatment for the Almeida, Ten Billion for the Royal Court, The Kitchen, His Dark Materials (Olivier Award for best set design) and Mother Clap’s Molly House for the National Theatre, Six Characters Looking for an Author for Young Vic, King Lear for Liverpool Everyman and Young Vic, No Man’s Land for Gate Theatre Dublin, The Tempest and A Midsummer Night’s Dream for the Royal Shakespeare Company, The Distance From Here and The Hypochondriac for the Almeida, A Life in the Theatre for the Apollo, West End, and The Frogs in the Lincoln Center, New York.